Introduction: A prism can be used to break light up into its constituent spectral colors (the colors of the rainbow). Prisms can also be used to reflect light, or to split light into components with different polarizations. 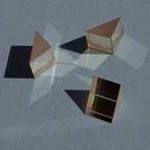 Right Angle Prisms can bend light at either 90-Deg or 180-Deg and can be used for retro-reflectors, telescopes, and mirror substitutes etc. The right angle surfaces may come with anti reflection coating at different wavelength. Right Angle Prisms can bend light at either 90-Deg or 180-Deg and can be used for retro-reflectors, telescopes, and mirror substitutes etc. 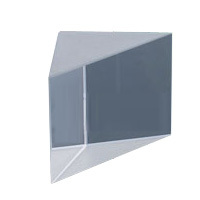 The right angle surfaces of the prism may come with anti reflection coating at different wavelength. The hypotenus surfaces of the right angle prisms are aluminum coated with protective SiO coating, and/or a protective black paint coating per request. 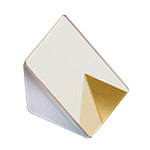 Introduction: The hypotenus surface of the right angle prisms are gold coated, the thickness of gold layer is 40-50nm. Introduction: PHOTONIK SINGAPORE offers optical elements made of high quality synthetically grown Rutile Titanium Dioxide crystals. Rutile's strong birefringency, wide transmission range and good mechanical properties make it suitable for fabrication of polarizing cubes, prisms and optical isolators. Boules having high optical transmission and homogeneity are grown by proprietary method.